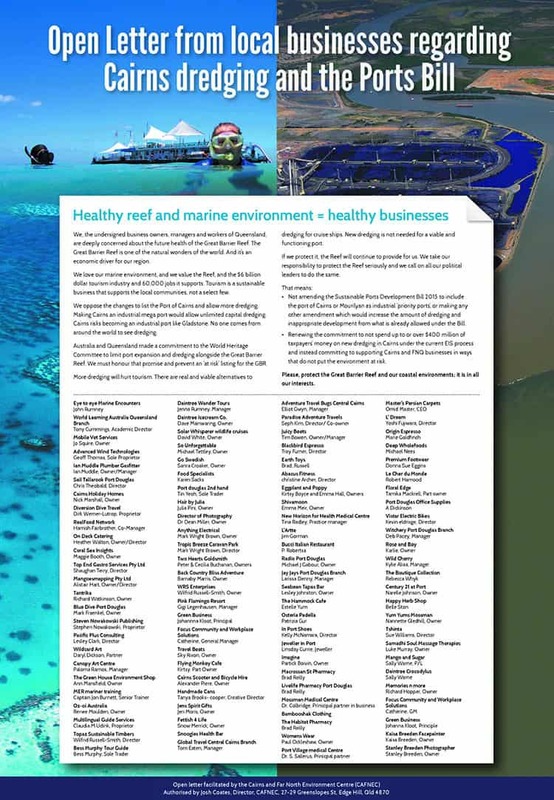 Over one hundred local businesses from Cairns and the far North have signed an open letter calling on the Government and LNP to not amend the Sustainable Ports Development Bill 2015 to list Cairns and Mourylian ports as industrial ‘priority ports’ and to not allow new dredging in Cairns. CAFNEC is proud to to be able to assist in giving the small businesses community a voice on this important issue. “The fact that over one hundred Cairns and Far North businesses have put their names to this open letter sends a clear message to the major parties that industrial ‘priority port’ listing for Cairns is not broadly supported. We know that protecting the Reef and our reputation as a nature based tourism destination that respects our environment is crucial to our economic future. Many of the small and medium sized businesses we have talked to are concerned that a small group of vested interests are attempting to push the Government toward amending the bill at the expense of our environment and tourism industry. With the Ports Bill set to be voted on in parliament very soon most are pleased to see the Government is so far sticking to it’s guns and ruling out industrial port status for Cairns. The Ports Bill only restricts large scale channel dredging and will not affect our ability to provide for our important reef tourism fleet into the future. The Sustainable Ports Development Bill as it stands fulfils our promise to the World Heritage Committee to limit new dredging to only a few bulk commodity ports under the Reef 2050 plan. The push from vested interests to list Cairns and Mourilyan as industrial ports is misguided and puts our reputation as Reef stewards at risk. The last thing we want to see is a back down on our commitments leading to ‘at risk’ listing for the reef when UNESCO review our progress in implementing the Reef 2050 plan next year. economic driver for our region. We love our marine environment, and we value the Reef, and the $6 billion dollar tourism industry and 60,000 jobs it supports. Tourism is a sustainable business that supports the local communities, not a select few. 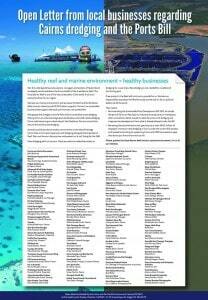 We oppose the changes to list the Port of Cairns and allow more dredging. Making Cairns an industrial mega port would allow unlimited capital dredging. Cairns risks becoming an industrial port like Gladstone. No one comes from around the world to see dredging. Australia and Queensland made a commitment to the World Heritage Committee to limit port expansion and dredging alongside the Great Barrier Reef. We must honour that promise and prevent an ‘at risk’ listing for the GBR. More dredging will hurt tourism. There are real and viable alternatives to dredging for cruise ships. New dredging is not needed for a viable and functioning port. If we protect it, the Reef will continue to provide for us. We take our responsibility to protect the Reef seriously and we call on all our political leaders to do the same. • Not amending the Sustainable Ports Development Bill 2015 to include the port of Cairns or Mourilyan as industrial ‘priority ports’, or making any other amendment which would increase the amount of dredging and inappropriate development from what is already allowed under the Bill. that do not put the environment at risk. Please, protect the Great Barrier Reef and our coastal environments; it is in all our interests.